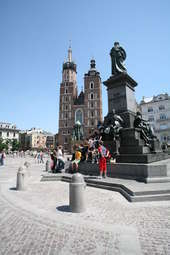 as the Straży (Guard), Budzielna (Waking), Alarmowa (Alarm) and Hejnalica (Heynal) Tower – is the only tower in the world from which a trumpeter has played the Heynal (bugle call) to the four quarters of the globe every hour throughout the whole day for over six hundred years. In order to see and hear these marvels one has to climb 239 steps to the height of 54 metres. St. Mary’s trumpeter needs two and a half minutes. We do not have to hurry that much. What is most important is that up there we are expected by the always cordial heynal guards, the last magicians of Kraków. Trumpets have played from the towers and gates of Kraków ‘forever’ announcing the beginning and end of day. Behind the walls the morning opening of the gates was awaited by the travellers met by the night near Kraków.